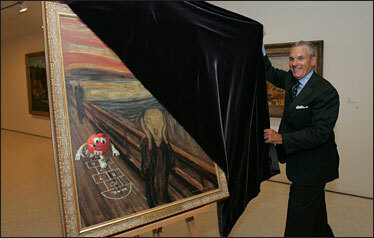 Did M&M’s help find Munch’s ‘The Scream’? Police have just announced that they’ve recovered two Edvard Munch paintings, including his famous work The Scream, that were stolen from an Oslo museum in 2004. Is it a coincidence that Mars just last week began offering a reward of 2 million dark-chocolate M&M’s for the return of the painting? (The promotion is tied to a new ad for Dark M&M’s that shows the red M&M playing hopscotch in the background of the work—“bringing a bit of levity … to the famous dark existential painting,” according to Mars.) The fine print doesn’t seem to include any obvious caveats—it seems the Norwegian cops are owed 2 million little ones, whether they had their eye on them or not.